Welcome to the Murray River Guide, your guide for everything to see and do while visiting one of the world’s greatest river systems – Australia’s spectacular and iconic Murray River Region. 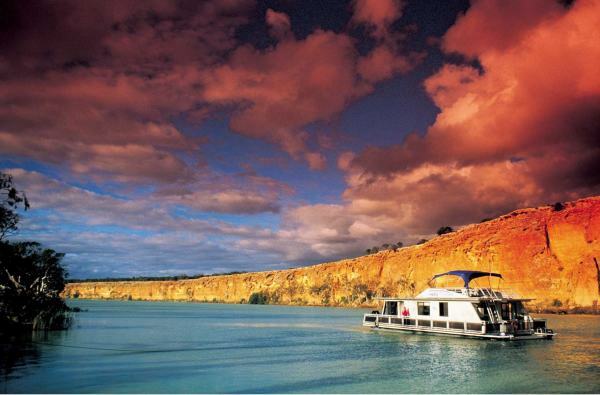 Australian’s and overseas visitors simply find the Murray Rivers tranquility and natural beauty charming. There’s something incredibly relaxing and enriching about the Murray that will make you want to come back for more. The Murray River begins as a small stream, from rain and snow melt, way up in the Australian Alps. It is joined by several other rivers along its journey, which flow from as far away as southern Queensland, mid New South Wales and central Victoria. Over thousands of years, the Murray River has meandered and shaped steep river banks, cliffs and sand bars along the Murray Mallee, where it touches the edge of the Australian Outback. You’ll discover abundant wildlife and native Australian flora that will bring out your inner peace, as well as towering limestone cliffs before it finally enters the Southern Ocean at Goolwa in South Australia. The Murray River Guide has been designed to ensure you enjoy your holiday in the Murray River region, by finding the best Murray River accommodation, attractions, activities and events to go to. Our aim is to take the guess work out of choosing your next holiday experience, and provide a easy-to-use resource to find the holiday your looking for. We methodically review the various regions to giving you our personal referral. Look out for this icon 😉 which highlights the reviewed businesses. We visit a wide range of Murray River attractions and local accommodation businesses, meeting them face to face so we can appreciate for ourselves what they offer. This gives you a non biased appraisal from us to which you and past guests can add. We know that there is so much to do in the Murray River region that it can be very hard to know where to start. We want you to come to the region to enjoy everything it has to offer from finding the best Murray River Accommodation and Houseboats, to visiting the Murray Darling Basins finest wineries, golf clubs, river cruises and camping spots to name a few. If you truly looking for a unique experiences or are looking to unwind, the Murray offers you every possible opportunity to explore, reconnect and simply relax. Here’s your chance to immerse yourself in the soul, spirit and flavour of Australia’s greatest river, the Murray.